This morning I traveled with Pushpika and Adele to Thane, a bit north of Mumbai, to visit the workshop of the Arpaan group. 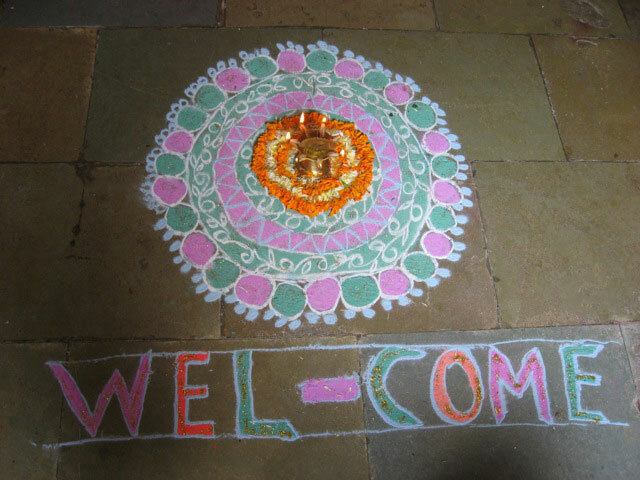 We were greeted with beautiful floor designs made from colored powder and we lit the oil lamp as part of the welcoming ceremony. As we were admiring their pleasant and spacious room, we spotted some charming wall decorations made from fabric and mirrors.The artisan who had invented these Sangeeta was pushed forward, and there was an impromptu mini-design workshop as everyone examined the pieces and discussed options. You may be seeing these pretty decorations in a future catalog! 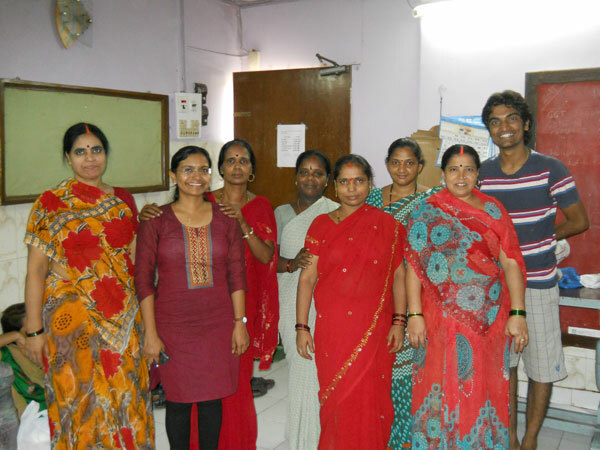 After sharing an incredibly delicious meal cooked by the artisans, we headed back to Mumbai.In the MarketPlace office some of the artisans were rehearsing a play, part of the social action program against domestic violence. A professional actor was working with them, helping with such performance details as voice projection and the mechanics of a stage slap. A drummer also provided occasional dramatic sound effects. When the artisans perform these plays in public, they will be using drums to call attention to themselves and help gather an audience. Despite the very serious subject matter, there was laughter and easy banter as the group worked together. But it was clear that they were wholly committed to this project and took its mission very seriously. Loved to see and read about marketplace Mumbai. we have a similar organisation and we would wish to have your guidance. We teach the village girls to make cotton bags of different kind, with different embelishments like embroidery etc.I would be happy if you could guide us in marketing the products.